Earlier this outdoor season, we noted some of the first HepsNation athletes who hit the Olympic Games standard in their events. We can now add on a few more names to that list as we have looked through the international rankings and received word from other track & field fans on our athletes’ status. Cornell now has a total of three athletes who have hit an Olympic standard. Muhammad Halim (Cornell ’08) is expected to make his second Olympic Games this summer as he met the triple jump standard of 16.85m back in April. At a meet in Baltimore, Halim won with a distance of 16.99m (55-08 3/4) – a new personal best. 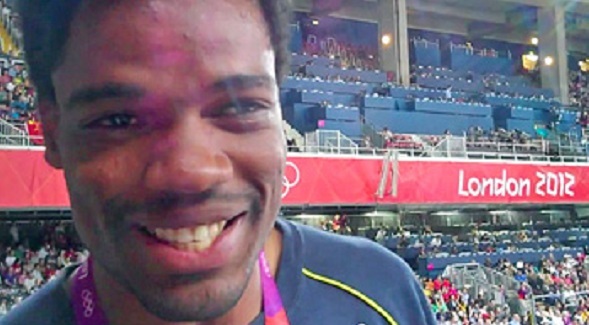 Halim competed in the 2012 London Games for the U.S. Virgin Islands where he finished 18th overall. Stephen Mozia previously met the Olympic Standard this past February as indoor marks are allowed for Olympic Games qualification. But he has continued to surpass the standard of 20.50m as he has an outdoor seasonal best of 20.73m (68-00 1/4) that he threw in early May. He competes for Nigeria. This past week, he earned two bronze medals for the Green and White at the African Championships in South Africa, as he threw 19.84m in the shot put and 59.16m in the discus. Another HepsNation athlete will likely join Mozia in representing Nigeria in Rio in August – Harvard rising-senior Nikki Okwelogu. Okwelogu’s conference record performance from the NCAA East Preliminary Round in the shot put (58-09 1/4 or 17.91m) exceeded the Olympic standard of 17.75m. Okwelogu also was in South Africa for the African Championships, where she won the discus throw on Friday in a new personal best – 56.75m or 186-02 1/4 – which is a new all-time Heps record (note, since this was done outside of the NCAA season, we do not consider it a conference record) but shy of the Olympic standard of 61.00m (200-01 1/4). 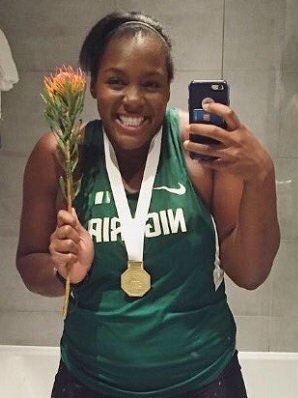 The picture to the right is Okwelogu with her gold medal – who wouldn’t want to take a selfie with a gold medal? She followed that up with silver medal in the shot put (17.07m) on Sunday afternoon. Speaking of gold medals, Columbia alumna Nadia Eke earned her first gold medal at the African Championships as she won the triple jump. She won by almost 2 inches with a wind-aided leap of 13.42m (44-00 1/4). She previously won a silver medal in this event back in 2014. Her season’s best is 13.82m (45-04) – short of the Olympic standard of 14.15m, or 46-05. As always – if we are missing any results or news, feel free to contact us on social media (@hepstrack on Twitter or hepsnation.com for facebook) or email and we will update the rest of HepsNation! This entry was posted on Monday, June 27th, 2016 at 6:57 am. It is filed under Olympics, Spotlight. You can follow any responses to this entry through the RSS 2.0 feed.